Battle Nibbs is here! Clad in fiercesome armour, and with freshly-brushed fur, she pounces onto the battlefield with the most powerful Zurian in the Universe! The hunt for Skreeletor is on! This DLC contains a custom skin for Nibbs in Awesomenauts: Starstorm, and comes with a fully customized voice set! © 2012-2013 Ronimo Games. Ronimo Games and Awesomenauts are trademarks or registered trademarks of Ronimo Games. 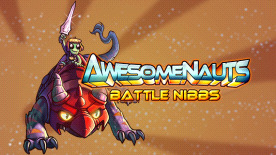 Requires [Awesomenauts](http://www.greenmangaming.com/s/gb/en/pc/games/indie/awesomenauts/) (base game) AND [Awesomenauts: Starstorm](http://www.greenmangaming.com/s/gb/en/pc/games/indie/awesomenauts-starstorm/) to use this DLC.